We had some half-term fun last week. We started off with a few chilled out days indoors, watching films, crafting & colouring as the weather was rubbish. The week got a bit better with a trip to Kent for a birthday party breaking up the boredom. It took me a day or so to recover and feel up to leaving the flat again but by the Sunday I decided to take the girls for a walk. 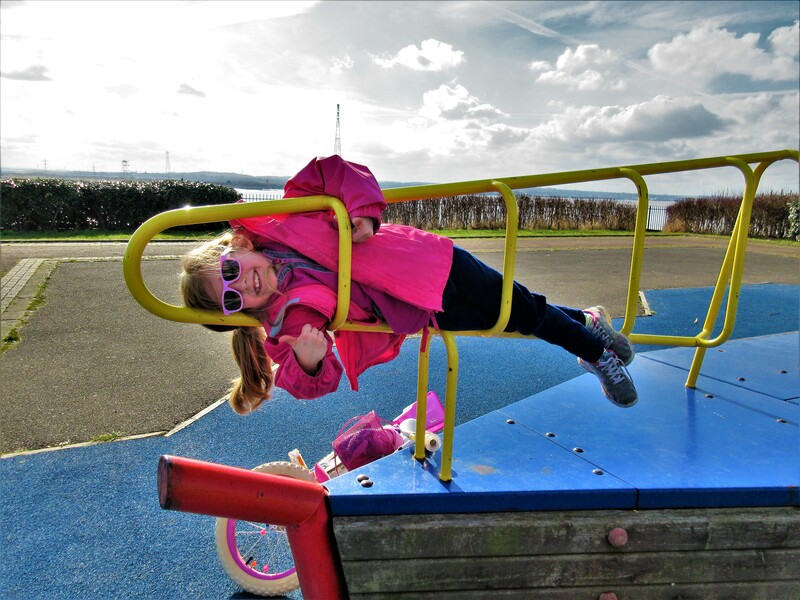 We had plenty of half-term fun indoors but we needed to break it up and get some air. The girls needed to burn off some energy too and the sun even appeared for a bit! Of course, this gave me a good excuse to get outside with my new camera and play with it a bit more. Eva decided she wanted to take her bike so of course, Izzy had to take her scooter too. 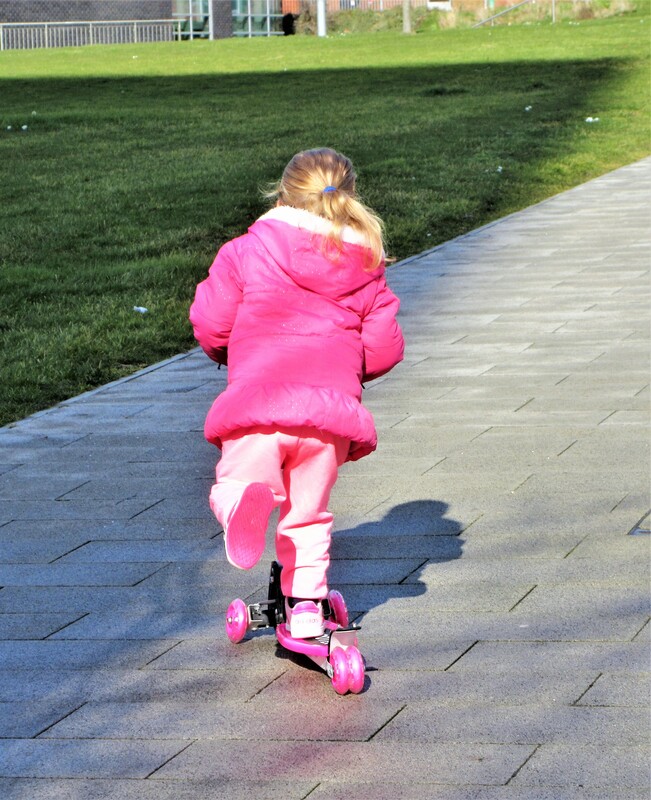 Before heading along the river we popped to the local shop for drinks to take with us and I captured this shot of Izzy zooming through the college. 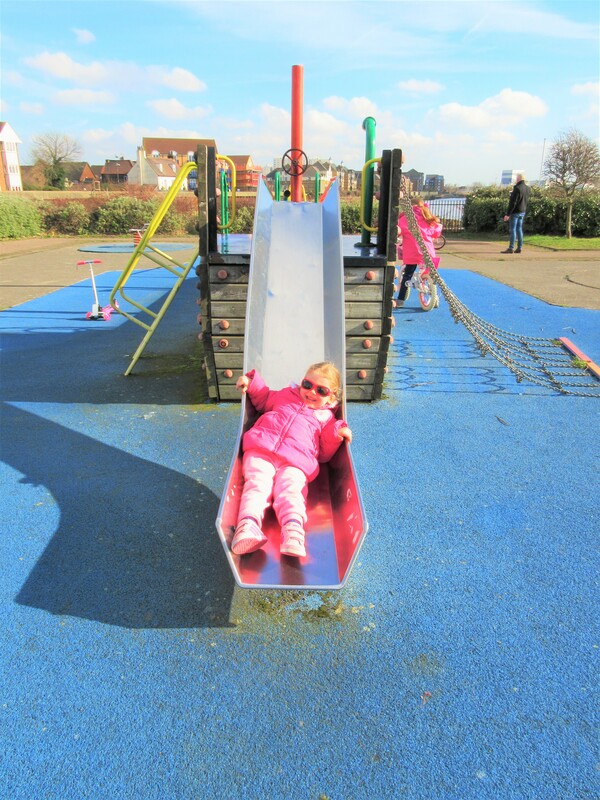 When we got to the park, Izzy discovered her love of slides again. She had loads of fun climbing up the ship and sliding back down again. She looks so happy here, hopefully, the sun will shine more and we can enjoy many more weekend walk’s! Not sure she is correct but points for effort! Oh and waiting whilst I faffed having forgotten my own sunglasses and being blinded a little. What do you think? 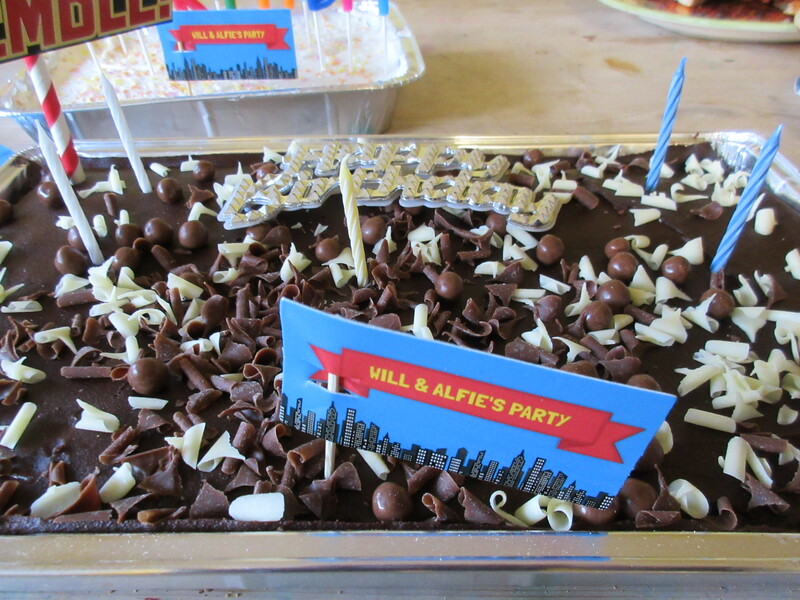 We’ve had quite a crafty Easter half term so far! Our awesome friends Slim & his mum spoilt the girls with a ton of crafty gifts to keep them busy across the half term. I’ve also been building up our stash over the last few months so the girls have had tons of fun deciding what to make. We’ve been using the Bendon Craft project idea book from the giant craft jar, some we have adapted & made a little differently too! The first craft the girls decided they both wanted to make at the same time was a peek-a-boo puppet from the crafts projects workbook included in the GIANT craft kit the girls received. These are cute little chicks in eggs and so simple to make even Izzy was able to literally get stuck in gluing the pieces on. Izzy mastered using the scissors thanks to this craft and it was finished within minutes. Simply cut out an egg shape, use wonky scissors to cut it in half & stick each half on the front of the peg making sure the egg joins together. Then cut out & draw/decorate you chick & stick it to the back of the peg. Both girls really enjoyed making these and they are pretty cute too! After that the girls decided to do different things, with Eva making necklaces using foam shapes & pipe cleaners (no photo’s please!) and Izzy deciding to make an Owl Mask using one of the templates from the craft kit. Izzy loves owls and was telling me to cut out purple paper for the eyes (yes the dodgy eyes are my doing haha!) and cutting out the eyebrows herself. Whilst Eva was busy cutting all the fluff off a pipe cleaner (I have no idea why I wasn’t allowed to know.. it was a top secret make it seems!) Izzy was stealing it all to add to her mask haha! Our absolute favourite make this week, which you may have already spotted over on Instagram, is the Pot of flowers Izzy made (and the monster to hide in them of course!). We adapted the idea using the craft project book and decided it was much easier to use foam flowers, push pipe cleaners through the middle & twisting it to secure the flower. After making several of these we found a metal seasoning pot which already had holes in the top and covered it in Washi tape before popping the flowers in. Izzy then decided it needed a butterfly on the front and eventually even a monster! These crafts were simple yet fun to do and easy enough for Izzy to do most of the work. We will be using the craft kit & crafting project book again over the Easter half term and see what other makes we can come with! 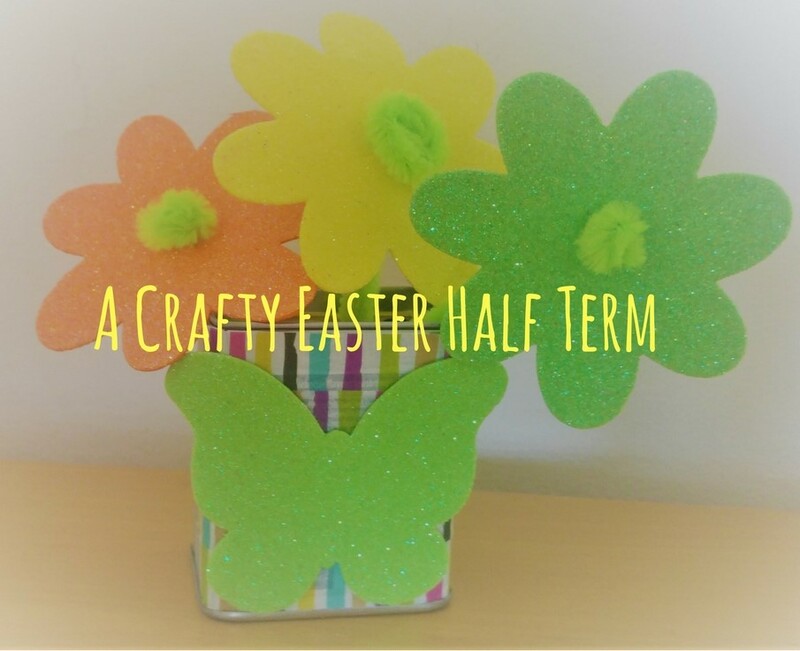 Will you/are you having a crafty Easter half term? What crafts have you made/will you be making over the Easter half term? Eva was rather pleased with herself this week when she spotted these purple flowers for me! Normally Eva is at school on shopping days, as it’s being half term she came with us. She spotted these, happy she could help find something purple for #MySundayPhoto!